Hello 🙂 It’s already the second Sunday of November, where does that time go?? As it’s Sunday, it’s my turn for an inspiration post for the current Ching-Chou Kuik Facebook challenge. Our theme is Christmas, and there are some absolutely gorgeous Christmas images available in Ching-Chou’s Etsy store. I used Holly Angel for today’s card. I colored her up with my Copic markers…..then got totally lost as to what to do!!! Previous Post Previous post: Twins! 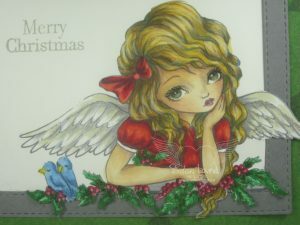 Beautiful colouring for this delightful whimsical Holly Angel. Love the white pen faux stitching too . Pretty card – the paper is a perfect backdrop for that image. Thank you for joining in the challenge at CHNC with an optional twist of Use A Button or Two Or More. Thanks for joining us at CraftyHazelnut’s Patterned Paper Challenge for November!